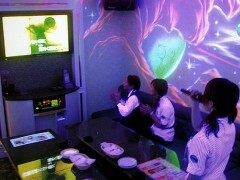 As you know, Japanese people love karaoke. Nowadays karaoke establishments have improved for parties. You can choose to pay for a room or per person. Also some karaoke places offer special courses that allow you to sing and drink until next morning for just about ¥3,000 each person. Of course there are many American songs too! Enjoy singing with family and friends with karaoke!